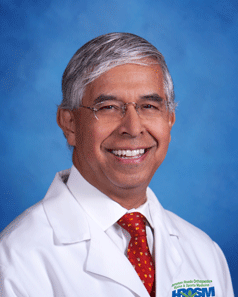 Daniel R. Cavazos, MD, F.A.A.O.S. Dr. Daniel Cavazos has been practicing medicine since 1986. He completed his undergraduate degree at the University of Texas and received his medical degree from the Uniformed Services University of Health Sciences, F. Herbert School of Medicine in Bethesda, Maryland. He completed his surgical residency at the University of Connecticut Center of Health Sciences in Farmington, Connecticut. He served in the United States Air Forces for twenty years, and was the the Chief of Orthopaedics at Langley Air Force Base, and retired in 1998. It was then that he joined Hampton Roads Orthopaedics & Sports Medicine. Since joining HROSM, he has enjoyed advancing the group’s reputation for progressiveness and innovation. Dr. Cavazos assisted in recruiting the first Physician Assistants to the practice, developed the Workers’ Compensation Program and was instrumental in HROSM becoming the first private practice in Virginia to receive a Certificate of Public Need to purchase its own Open Multi-Positional MRI. Dr. Cavazos specializes in sports medicine, arthroscopic surgery, and minimally invasive total joint replacements. He is licensed by the States of Virginia and Texas to practice medicine and is Board Certified in Orthopaedic Surgery. Recently, he opened a second office in the New Town Section of Williamsburg, Virginia. Dr. Cavazos tries to balance his rigorous schedule as an orthopaedic surgeon with his responsibilities as a husband and father to six children.